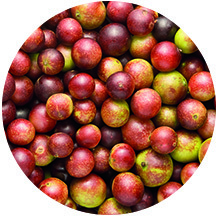 The camu camu berry contains a rich amount of vitamins, amino acids and bioflavonoids. It’s extremely high in vitamin C, which makes it one of the latest of the Amazon’s natural wonders. The berry is rich in Vitamin C.
Contains minerals such as calcium, riboflavin, niacin, thiamin, phosphorous, iron and beta carotene. Helps maintain healthy eyes and skin. Strengthens the immune and nervous system. Helps maintaining healthy levels of white blood cell formation and detoxifying the body. Direct consumption (water, juices, yogurt). The powder can be used to flavor other foods. Camu camu flavoured ice creams and drinks are popular in Peru.